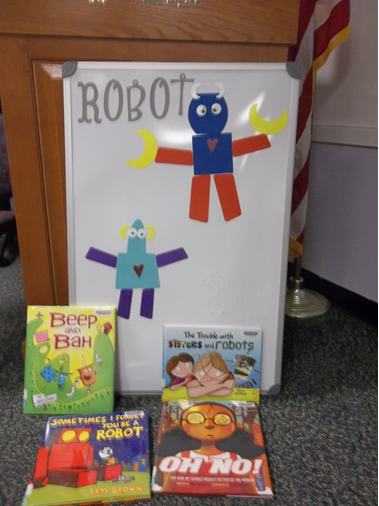 Recently for my Saturday storytime, I focused on robots. What better way to break into doing digitally enhanced storytimes than with stories about tech? Even if said stories are silly. Being that this would be my first ever storytime using the iPad, I knew the planning would be important. Luckily, the Southington Public Library has a bunch of iPads that are routinely used in wonderful programming as part of the Children’s Department repertoire, so I had a good knowledge base from which to start. While I had the experience of my coworkers behind me, my regular Saturday audience—an audience that isn’t always able to make our weekly programming—hasn’t been exposed to our latest technological programming. I wanted to make sure I impressed this batch of parents, grandparents, and guardians with a seamless program that the kids enjoyed. I wanted to make sure they had a great time and saw the positive potential that such devices have when working with children. Recently there has been a lot of discussion in the media about the use of handheld devices with children—both positive and very negative. I wasn’t sure how the adults in my storytime would react to such a storytime deviation and was mentally preparing for mayhem. So, to combat that, I chose solid stories, both paper and digital, and I included a lot of movement, singing, and other traditional storytime activities. Despite the seamlessness of planning, there remained one issue: the iPad screens are not ideal for group sharing. Most of the iPad programming at the library is based on the 1-to-1 ratio, so screen size isn’t an issue. Talking with my department head, we ordered connecting cables in order to project the iPad screen onto the wall. However, the cables had not arrived come Storytime day. I wasn’t overly worried, since my Saturday drop-in doesn’t usually exceed 8-10 kids and 10-16 adults. A nice small group. I planned and practiced and got everything in order. I knew I was going to read the storybook app, not listen to the pre-recording; that way I could go at my own pace, and add my inflection. I knew where all the tap, swipe, shake, etc., extras were and played with them as I practiced. 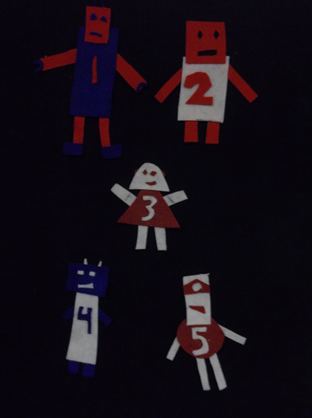 I organized my roster of robot songs, cut out my little felt robots for the flannel board, and even made a “build a bot” section with magnetic pieces to get the kids thinking and designing creatively. I planned shaker songs, dance breaks, counting, and construction. I had everything covered. Storytime started just after 3:30. I had a combined group of 26, which is a good turnout. Everyone trouped into the program room and quietly sat down in little, familial groups. I walked in and started the day as usual by singing our hello song and getting the kids to shake their sillies out with a movement poem. We recited a robot version of “Teddy Bear, Teddy Bear, Turn Around.” Next, we sang our have a seat song and read The Trouble with Sisters and Robots by Steve Gritton. While the kids liked the story, and giggled, they were very quiet and didn’t shout out answers when I asked questions. Instead they whispered the answers to their parents, or kept silent. I worried that this wouldn’t be the ideal group for the first foray into tech-land, but pressed on. They got a little livelier once we had a dance break and did the “Five Noisy Robots” flannel board. Then something amazing happened. I took out the iPad and told the kids I had a special surprise story for them. That’s when they broke out of their shells and really started participating. This isn’t all that surprising, but it was still a very feel-good moment to see the kids breaking away from their adults and crowding around me. I decided to read Pete’s Robot by HeartDrive Media LLC. Pete’s Robot focuses on creative builder Pete, who builds a robot named Z-123. When Pete forgets to install Z’s heartdrive, the robot runs amok doing things that should be helpful, but end up causing mayhem (and giggles)—like delivering the mail (to the wrong houses) and baking one extremely foul smelling pie. When Z-123 comes upon a little girl with her cat stuck in a tree, he wants to help, but he can’t! He’s missing his heartdrive and doesn’t know what to do! Cue one very out of breath Pete and his equally out of breath dog, Spot. Once Pete corrects his mistake and installs the heartdrive, Z saves the cat from a tree and becomes a hero. Then, Z-123, Pete, and several townspeople (and the cat) form a rock band! Since I wasn’t able to project the story onto our big projector screen, we were all a little squashed together. I think this added a fun, humanizing element to a story about a robot missing his heart. While planning and practicing for the program, I had counted each and every drag and drop, swipe, shake, and sound that the app contained. When the kids came in, I gave them each a number. As the kids crowded around and helped me drag and drop, swipe, and even shake our way through the story, they remained rapt and waited patiently. After I had read the text portion of the page, I called out a number and the corresponding child picked one of the interactive elements on the ebook page. They all took turns and there was no fighting. 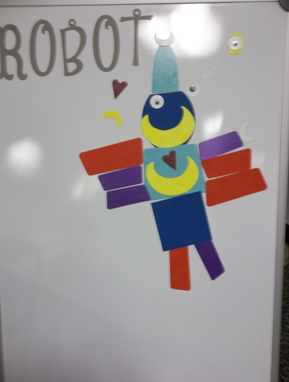 After we finished the app, I let them build their own bot with the magnetic strips, where again they worked great together, often talking about where they thought pieces should go. The picture below is the robot we ended up with. We finished the day with one more story, Sometimes I Forget You’re a Robot by Sam Brown, a few more songs, and then our goodbye chant. When I polled the parents about whether the use of the iPad was something they liked and thought I should continue, I received many enthusiastic and resounding yeses. My heart leapt. I can’t wait to use more tech in my programming and see where else I can take it. I really enjoy the combination of the pictures, the interactive nature of the book itself, and the ways that the iPad leant itself to group participation in a different way than traditional books. I look forward to doing more digitally enhanced storytimes in the future, and can’t wait to use the connecting cables! 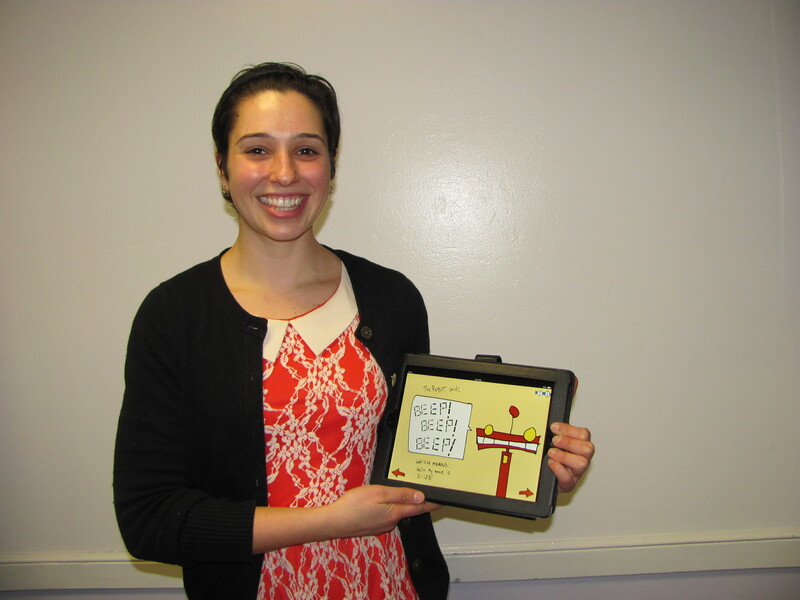 Ms. Molly is a Children’s Librarian at the Southington Public Library who loves storytime and messy science experiments. She has an extreme case of wanderlust, which is inhibited by real life, so she reads a lot. She is a proud nerd & geek, a superhero on weekends, and attempts to do everything—though not all at once. Check out her library blog at http://missmollythelibrarian.wordpress.com/. Posted on March 28, 2014, in Apps, Story Time and tagged Molly Virello. Bookmark the permalink. 1 Comment.